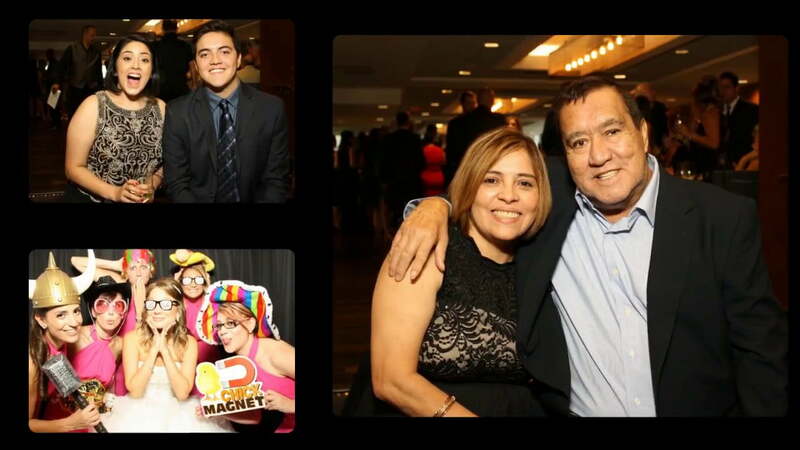 Remembering the GREAT evening we had celebrating Carlos and Samantha’s wedding at The Renaissance Allentown! So much fun and excitement all night. Samantha and her bridesmaids were stunning! The bridesmaids gowns were a gorgeous pink and were accented perfectly with flowers from Ruby’s Floral Factory! The uplighting and LED Dance Floor from Rockin’ Ramaley were a perfect addition and really brought the room to life when the dancing began! Kate, from Douglas Benedict Photography, was busy all night capturing all the memories that will be held dearly! The cake, which The Renaissance Allentown created, was a perfect fit! It was simply elegant and followed the decor with black, white and a little sparkle! The evening was just spectacular! The Rockin’ Photobooth Team LOVED being part of your wedding day! "This guy...he's too much! (In all the best ways!) For some reason, the music selections were one of our most difficult decisions. Kevin supplied the music for our ceremony, cocktail hour, and reception, as well as fun lighting in our ballroom (that was the perfect touch). When we finally met with Kevin to work through the details of our ceremony and reception, he gave us so many idea and options that it definitely lifted much of that burden! When we got to our day, everything was perfect. Things flowed smoothly, and he even brought fun props that I didn't expect but were a huge hit! (Clearly my crew is a fan of anything that lights up!) If you want a party and an energetic crew, Rockin Ramaley is the way to go!"